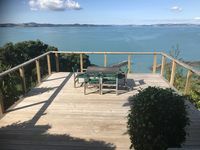 Properties in Rocky Bay (Whakanewha Bay) average 4.6 out of 5 stars. Property 4: The Barn - so close to the water! Property 18: Enjoy a carefree comfortable and well appointed holiday accommodation. Property 20: Studio 33. Sunny and spacious by Oneroa Beach. Property 39: Designer 1 Bedroom House With Stunning Sea Views! Had a wonderful time here in Maraetai, the accommodation was excellent and the apartment spotlessly clean. The views are magnificent and our host most helpful. Would definitely rebook.